A Rake’s Progress tells the story of the fictional Tom Rakewell in a series of eight paintings. Tom inherits a fortune from his miserly father – but then follows a path to vice and destruction. 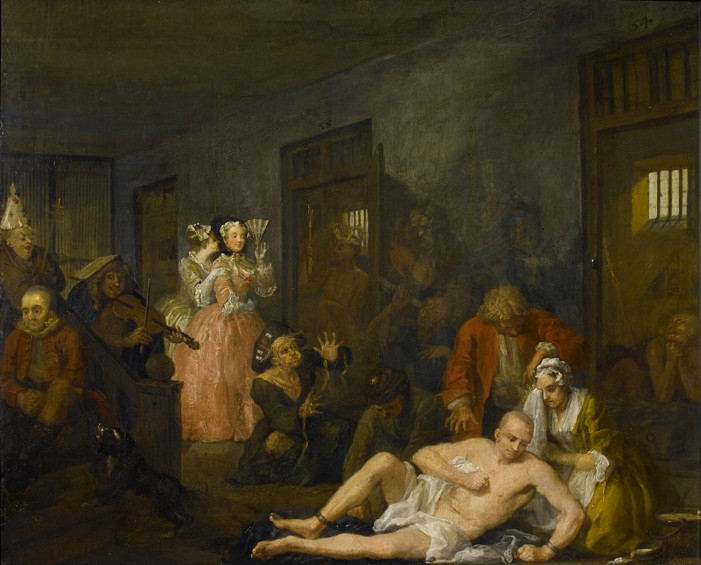 Painted in 1733, it followed the hugely successful A Harlot's Progress (1730) – another ‘modern moral subject’ – which was sadly destroyed in a fire in 1755. The paintings were bought from William Beckford at a Christie’s auction in 1802. Mrs Soane bid 570 guineas on her husband’s behalf. Originally hung at Soane's country villa, Pitzhanger Manor in Ealing, the paintings were moved back to Lincoln's Inn Fields in 1810. Then in 1824, Soane re-hung them in his new Picture Room where you’ll still find them today. In this scene, we meet our hero, Tom Rakewell. He has just inherited a fortune following the death of his miserly father, whose house is now yielding up its hoarded wealth. Tom attempts to pay off a servant girl, Sarah Young – her gold ring revealing an earlier, now retracted, promise of marriage. Behind Tom, an inheritance lawyer steals gold coins, while an upholsterer attaching fabric to the walls finds a hiding place for money which tumbles out servants find hidden treasures in the fireplace and money behind wall hangings. A starved cat looks for food in a chest full of silver. In his new palatial town lodgings, Tom holds a morning reception in the manner of a fashionable gentleman. 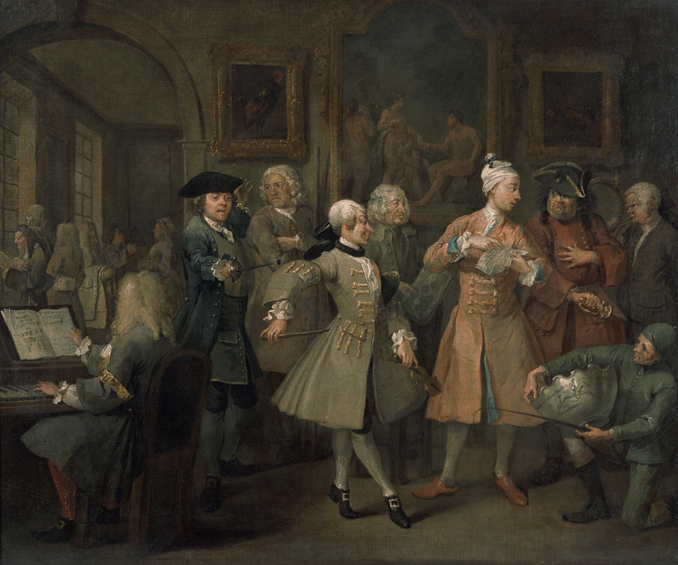 Several visitors arrive to offer their services: a jockey, a dancing-master (with violin), a landscape gardener (holding a plan), a poet, a tailor, and a musician (seated at the harpsichord, believed to be Hogarth's great rival, Handel. On the wall hang three new Italian paintings. 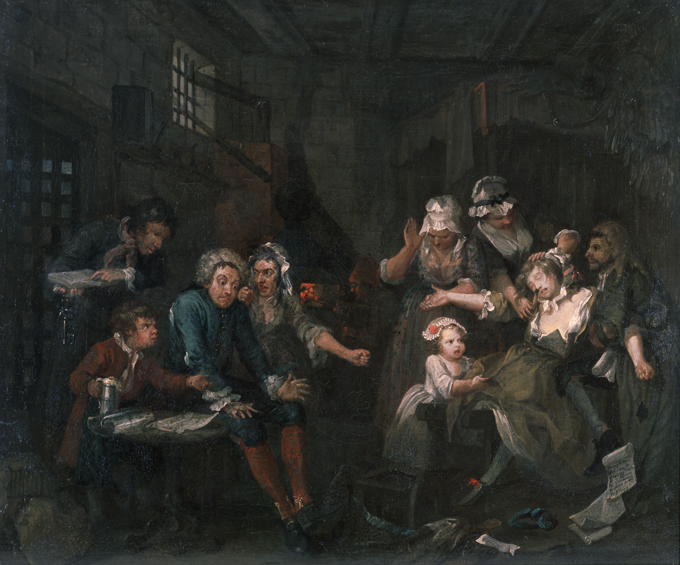 We imagine Hogarth’s scorn here – he was known to dislike the fashion of acquiring Old Master works (which he called 'dark pictures') at the expense of paintings by British artists. 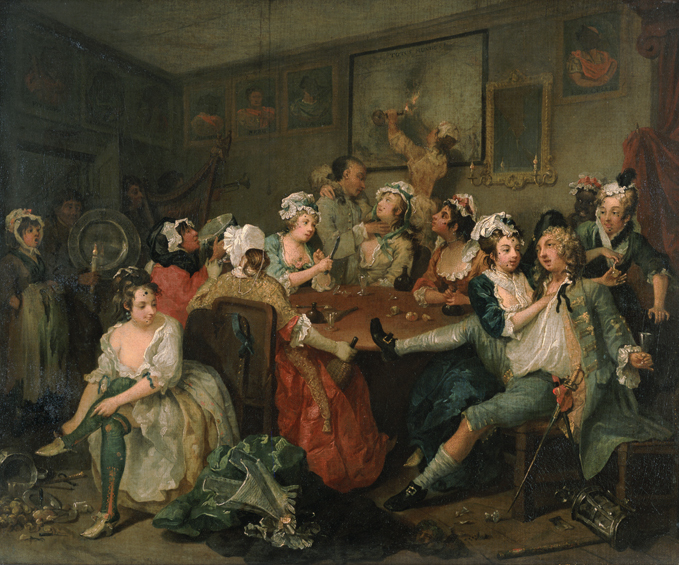 It’s three o'clock in the morning and Tom, drunk, enjoys the attentions of prostitutes at the Rose Tavern in Covent Garden. A night watchman's staff and lantern lie beside him – souvenirs of a rowdy night in the streets. Two ladies relieve Tom of his watch. In the foreground, a woman undresses, getting ready to perform naked “postures” on a pewter dish, being carried into the chamber behind her. Tom has squandered his fortune. On the way to the Queen’s birthday reception at St James’ Palace, he narrowly escapes arrest for debt. He is saved by the loyal Sarah Young, now a milliner, who pays his bail money with her meagre earnings. It is Queen Caroline's birthday – also St David's Day (1st March) – the two bailiffs wear leeks in their hats to mark the occasion. 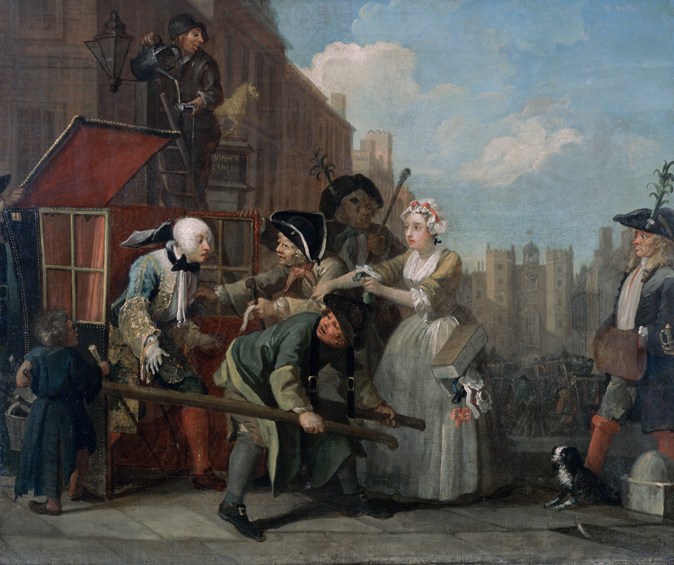 A street urchin steals Tom's gold-topped cane, while a lamplighter, distracted by the commotion, accidentally pours oil on Tom's wig. 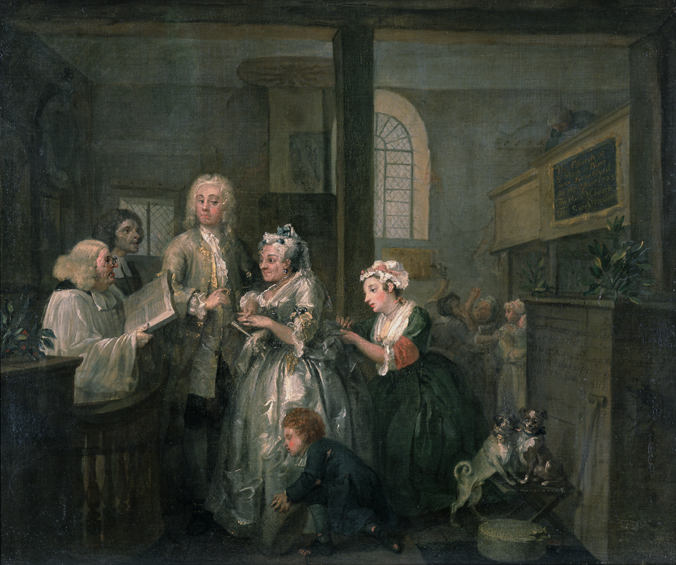 Impoverished, but accustomed to a life of luxury and excess, Tom marries an old woman for her fortune. The shabby setting is Marylebone church, then a well-known venue for clandestine weddings on the northern fringes of London. Tom is clearly more interested in the pretty young maid than in his one-eyed bride. Two dogs (one of which has also lost an eye) present a grotesque parody of the marriage. Behind them, Sarah Young and her mother are being held back at the church door. We are in White's Club, in Soho. Tom, wigless and cursing his fate, has just gambled away his second fortune. 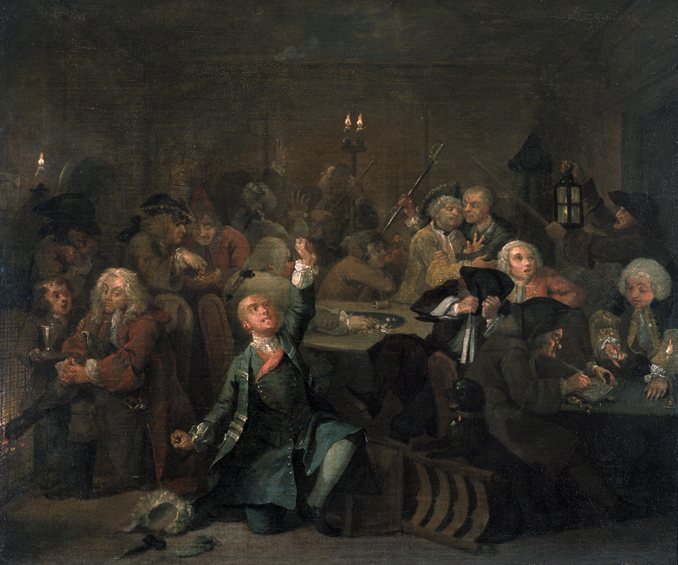 He’s not the only loser here – a dejected highwayman (with pistol and mask protruding from his pocket) sits by the fire, and a nobleman, eager to continue playing, pleads with a moneylender for an advance. Only two croupiers have noticed the smoke curling in from behind the panelling. Everyone else gambles on, unaware of the impending danger. Tom is now an inmate of the Fleet, London's infamous debtors' prison. Many prisoners are pursuing hapless schemes in the hope of freedom. Beside Tom lies a rejected script he has written. 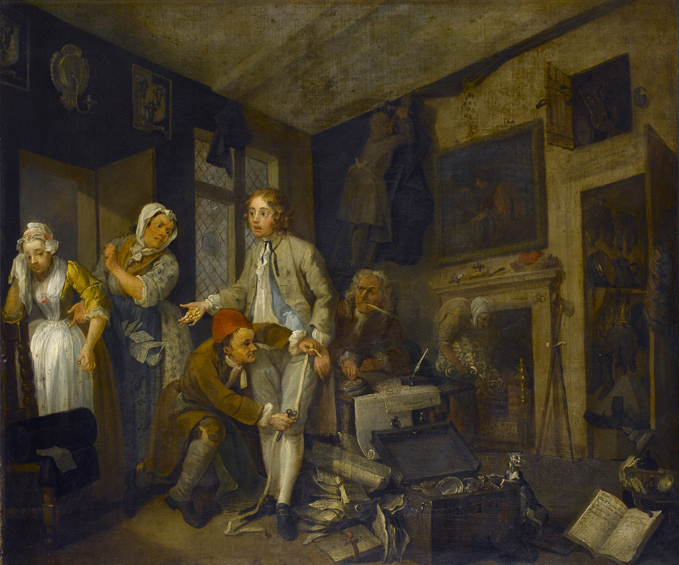 An older man with a beard has dropped a sheet of paper on which he has proposed a scheme for paying 'ye Debts of ye Nation' (a reference to a scheme for paying the national debt put forward by Hogarth's father). In the background another tries to make fools' gold at a forge. Tom has sunk into despair, and is exhibiting the first signs of impending madness. The beer-boy harasses him for payment while the gaoler demands that his weekly bill is paid. Tom’s wife scolds him for having squandered her fortune. Sarah Young, visiting with their child, has fainted from distress at the scene. Tom has descended into madness. He is now in Bethlem Hospital or ‘Bedlam’, as it was known. The inmates around him – a tailor, a musician, an astronomer and an archbishop – are suffering various delusions. One man thinks he is a king, but is naked, carrying a straw crown and sceptre. Bedlam is open to the public (as indeed it really was), and two fashionable ladies are sightseeing – for them, it’s an amusing day out, observing the poor suffering lunatics. The ever faithful Sarah Young sits, weeping, by Tom's side.